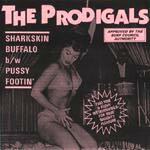 The Prodigals are from the great upper Midwest... a place that produced numerous great surf bands in the sixties despite being more than a few blocks from the ocean. While the A-side is good, the B-side is killer dude! Great artwork, but it's 'roxed instead of printed, so if there was color... jeez, I think I know the one on the left... er- uh- that's another story. I hear these cats are gonna be on a comp... but what I wanna know is when are they gonna ish a whole CD? Sharkskin Buffalo is ok, but not great. It's just not very interesting. It's a sorta Austin flavored rockabilly whammy bar number in search of a lead. This is one monster of a surf song, very infectious melody with an adequate supply of properly placed glissandoes. Hot dog!